Sub: SCERT, AP, Amaravati — School Education Department — Summative Examination —II Question Papers for Primary Level - Conduct of Workshop from 8-11-2017 to 10.11-2017 at DIETs— Orders — Issued - Reg. All the District Educational Officers and Principals of DIETs in the State are informed that as per reference citied above SA-II examinations for Primary level is scheduled from 16-12-2017 to 20-12-2017 in all the Primary Schools. 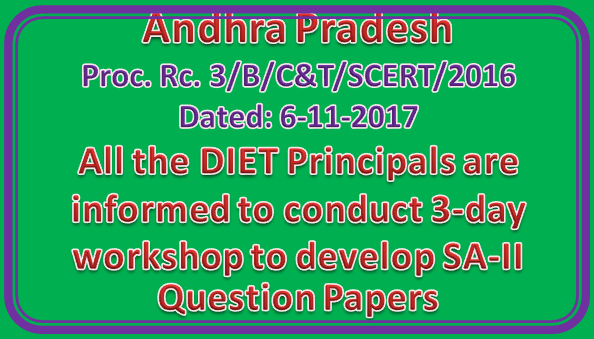 In this connection all the DIET Principals are informed to conduct 3-day workshop to develop SA-II Question Papers in the subjects of Telugu, English, Mathematics and EVS from class I — V duly maintaining Academic Standards and weightages. The workshop is scheduled from 8-11-20 17 to 10-11-2017 at their respective DIETs. Further, all the DIET Principals are informed to invite expert subject teachers to said workshop. The list of papers setters submit to District Educational Officer for relieving from their respective schools. The final version of Print Ready Soft Copies handed over to DCEB Secretaries for printing and supply of Question Papers well in advance. The Project Officers of SSA in the State are requested to instruct AMOs to attend the program and co-operate with DIET Principal to complete the work successfully and also requested to provide the budget to DIET Principals, after submission bills.